ANGELA J. DAVIS is an expert in criminal law and procedure with a specific focus on prosecutorial power and racism in the criminal justice system. She previously served as director of the D.C. Public Defender Service, where she began as a staff attorney representing indigent juveniles and adults. She also served as executive director of the National Rainbow Coalition and is a former law clerk of the Honorable Theodore R. Newman, the former Chief Judge of the D.C. Court of Appeals. Professor Davis is the author of Arbitrary Justice: The Power of the American Prosecutor (Oxford University Press 2007), has co-edited numerous books, and has published articles in the Michigan, Iowa, Fordham and Hofstra Law Reviews. Professor Davis is a member of the board of trustees of the Frederick Douglas Jordan Scholarship Board, the Southern Center for Human Rights, and the Sentencing Project. She was a reporter for the ABA Justice Kennedy Commission and a member of the ABA Commission for Effective Criminal Sanctions. She also served as a member of the Advisory Board for the Vera Institute of Justice Prosecution and Racial Justice Program. Professor Davis teaches Criminal Law, Criminal Procedure, and Criminal Defense: Theory and Practice. 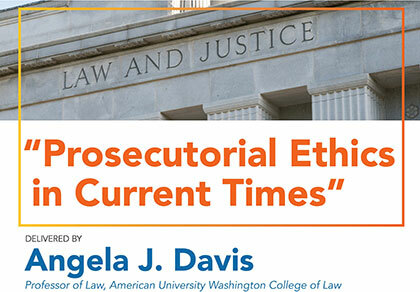 Davis, Angela J., "Prosecutorial Ethics in Current Times" (2019). Howard Lichtenstein Distinguished Professorship in Legal Ethics Lectures. 17.